One of the three leading state – cities of the ancient times! Built around the steep, dominating 116 meters high rock where you can see the acropolis with the long arc and the temple of Athena, is another proof of the inspired creativity of the inhabitants of this island through the times. The little white Aegean style houses with the picturesque lanes next to samples of the art of ancient Greece as shown on the huge war ship carved with astonishing details on the way to the top of the acropolis. At the edge of the city the long beach with the golden fine sand meets the crystal clear blue sea, giving a good reason for a relaxing cool break before settling down in the café and restaurants, making your day a perfect experience. Named after the name of the English admiral Smith, who was observing the movements French fleet during the expedition of the Great Napoleon, is the Acropolis of Rhodes with the Stadium, the Theatre that was also the School for oratory, the Temple of Athena, e.t.c. 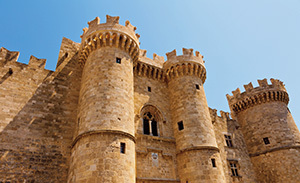 Rhodes historical places should not be missed.